This beautiful acrylic award is crafted from the finest acrylic and polished by hand to perfection. It features a 3 dimensional star carved deep into it's surface! Part of our patriotic collection, this acrylic award is available in your choice of blue, red, green, gold or purple reflective bottoms. 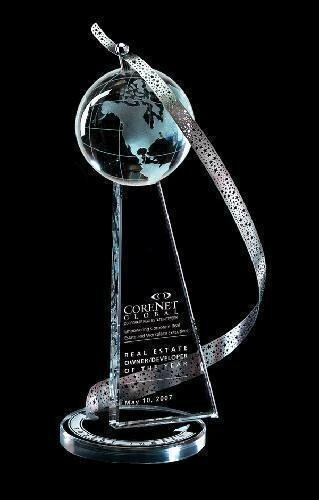 This is a beautifully crafted acrylic award featuring clipped corners, double bevels and 3 dimensional stars routed deep into its surface! Part of our patriotic award collection, this acrylic award provides plenty of room for custom laser engraving, color printing or both! Available in your choice of blue, red, green, gold or purple reflective bottoms. Present a truly different world to one who has truly made a world of difference! Wrapped in a stainless swirl, Above and Beyond portrays a person who exceeds worldly expectations. The statement is reinforced by the recipient's name positioned such that the swirl becomes an extension of the individual. Held in balance by its Star fire support, this award is proudly presented and proudly received. A romance card elaborating this theme is included for your presentation.